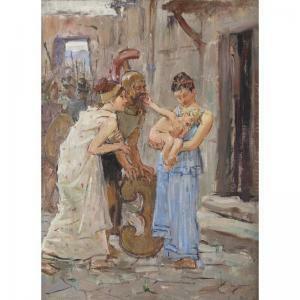 Find artworks, auction results, sale prices and pictures of Etienne Alphonse Dinet at auctions worldwide. FRENCH AT SUNSET, ON THE TERRACE Etienne Dinet 1861 - 1929 signed and dated E. DINET. / 1904 lower left oil on canvas 52 by 53cm., 20½ by 20¾in. Provenance Exhibited Paris, Salon des Peintres Orientalistes Français,1905, no. 202 Paris,Petit Palais, Exposition du Centenaire de la Conquête de l\’Algérie, 1930, no. 440 (as Amoureux sur la terrasse) Literature Denise Brahimi & Koudir Benchikou, La vie et l'oeuvre de Etienne Dinet, Paris, 1984, p. 236, no. 324, catalogued & illustrated (with incorrect measurements; asSur les terrasses après le coucher du soleil) Catalogue Note This rediscovered workcaptures atenderand intimate moment betweena young couple, possibly newly-weds, on the roof of a riad.The girl has pulled back her veil to revealher face adorned witha hennatattoo, in the shape ofthelower half of apalm tree, symbolising fertility. On her chin a cinsla (a chain pattern that is also often found in Algerian weaving), is clearly visible. Tattoos wereworn by Berber women to ward off the evil eye, to increase fertility or improve health, or to indicate that a girl had reached marriageable age. 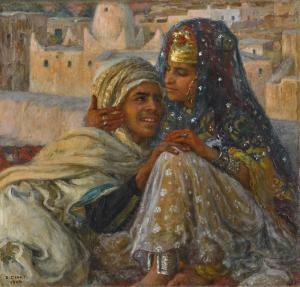 Dinet took great interest in painting the Berber community of Algeria, in its traditional costumes and way of life, particularlytheOuled Naïl tribe. Hisfascination with Algeria dated from his first visit in 1883. This proved to be a turning point in his career: he returned virtually every summer thereafter, visiting the capital and oasis towns of Bou Saâda, Biskra and Laghouat. In 1904 Dinet acquired a house in Bou Saâda, the closest of the oasis towns to Algiers some 150 miles south-east of the capital, choosing to settle there permanently. In his commitment to the places and people of Algeria, Dinet immersed himself in the life of Islamic north Africa: hespoke Arabic fluently, andin 1913 he converted to Islam, and changed his name to Nasreddin ('Defender of the Faith'). In 1929 Dinet went on the Hajj with his friend Slimane Ben Ibrahim. LOT n°22 ETIENNE DINET (FRA/ 1861-1929) Bou-Sâada, Algérie signé, daté et situé \‘E. DINET Bou-Sâada. 1884\’ (en bas à droite) huile sur carton 20 x 26,5 cm. 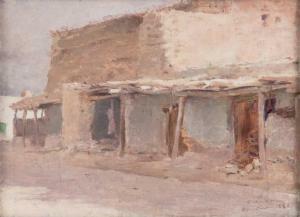 Peint à Bou Sâada en 1884 SIGNED, DATED AND LOCATED LOWER RIGHT; OIL ON CARDBOARD; 7.7/8 X 10.3/8 IN. ; PAINTED IN BOU SÂADA IN 1884. Monsieur Koudir Benchicou a confirmé l\’authenticité de cette œuvre. 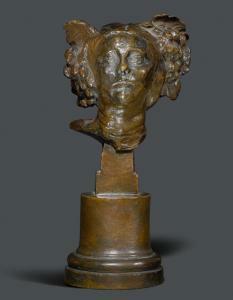 ÉMILE-ANTOINE BOURDELLE (1861-1929) SCULPTURE, dated 1910 Bronze with a brown patina. Head of Bacchus on a round plinth. Signed Bourdelle, sculpt 1910, with foundry mark Cire Perdue A.A Hebrard (9). H. 21 cm. 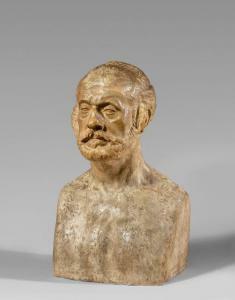 --------------- ÉMILE-ANTOINE BOURDELLE (1861-1929) SKULPTUR, dat. 1910 Bronze braun patineirt. Kopf eines Bacchus auf rundem Sockel. Signiert Bourdelle, sculpt 1910 und Giessermarke Cire Perdue A.A Hebrard (9). H. 21 cm.